Silly, smart-mouthed religious satire The Book of Mormon continues to attract flocks of faithful fans and has remained at the top of trending theatre ticket sales ever since it opened at the Eugene O’Neill Theatre on Broadway in March of 2011, said Marta Ault at BuyAnySeat.com. The nine-time Tony Award winning musical is still playing to over 100% capacity at the O’Neill with its touring casts currently performing at the Smith Center in Las Vegas and Wharton Center in East Lansing, Michigan. Naughty, bawdy religious satire The Book of Mormon is now playing in New York, Las Vegas and East Lansing before heading for Indy, Memphis and Detroit - and dozens of other U.S. cities this year. Is nothing sacred? Apparently not. In fact, audiences and critics overwhelmingly agree that this explicit satire on organized religion is scandalous, sacrilegious, scathing, potty-mouthed, irreverent and highly disrespectful. They also agree that the play is sweet, soulful and ultimately satisfying as well. Perhaps that’s why so many faithful fans continue to flock to this controversial yet comforting play, and why it consistently ranks at the top of ticket sales across the nation. Truth be told, the nine-time Tony Award-winner is so popular, it now has four productions at play around the world: the original musical at the Eugene O’Neill Theatre in New York; U.S. touring casts at the Smith Center in Las Vegas and Wharton Center in East Lansing, Michigan; and, still another touring company has performed an extended run at the Prince of Wales Theatre in London, England. One North American traveling production moves from East Lansing to the Murat Theatre at Old National Centre in Indianapolis on June 17, then to the Orpheum Theatre in Memphis on June 24, and on to the Detroit Opera House in Detroit on July 1, 2014. “That’s why we’re proud to be able to offer theatre-goers the most comprehensive and continuously updated selection of theatre tickets available online, with a worry-free guarantee to protect their purchase,” added Ault. From Coloradans Trey Parker and Matt Stone - the creators of South Park - and Robert Lopez - the co-composer/co-lyricist of Avenue Q - the Book of Mormon continues to receive an almost perfect 4.9 rating from audiences on Broadway, while critics give it a 4.7 out of five stars. (Source: entertainment-link.com). The musical itself tells the tale of two mismatched missionaries sent to deepest, darkest Africa to spread the good word. What happens to these missionaries in poor, starving, AIDS-plagued Africa is... well, R-rated. To some reviewers, the musical’s content is revolutionary and classic, hilarious and humane, funny and obscene. Other critics have called it blasphemous, scurrilous and more foul-mouthed than David Mamet on a blue streak – yet with a heart and soul as pure and pristine as a Rodgers and Hammerstein or Disney show. Just how shocking is it? Those who have seen South Park won't need any warnings, but the producers have issued a parental advisory due to explicit language. Yet, despite its adult themes and coarse content, critics call it “surprisingly sweet”, while Vogue magazine writes that the show "starts out as a potty-mouthed buddy comedy" before "winding up as a kind of parable," and concludes that the musical's "dirty little secret is its big heart." The musical played to 102.4 percent capacity at the 1,066-seat Eugene O’Neill Theatre again last week, which was once again the highest percentage for the week on Broadway, per official box office data provided by entertainment-link.com. The North American traveling productions have already played to full houses in Minneapolis, St. Louis, Rochester, Detroit, Pittsburgh, Boston, Chicago, Washington D.C., Dallas, Omaha, Houston, San Antonio, Austin, New Orleans, Denver, Milwaukee and many other cities. Currently, the touring casts are scheduled to visit or re-visit 51 more cities through 2015. 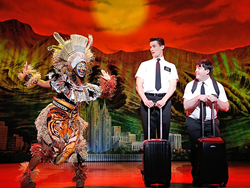 To shop for discount Book of Mormon tickets, visit BuyAnySeat.com. To save to even more, enter coupon code "BAS2014" during checkout. About BuyAnySeat.com: An online ticket marketplace, BuyAnySeat.com connects sports, theater and other live entertainment fans to an extensive worldwide network of ticket sellers. The site’s simplified listings and navigational tools enable fans to easily locate, compare and purchase inexpensive, discounted or lower-priced tickets to virtually all advertised sports and entertainment events around the globe. The marketplace, which is PCI-compliant and Norton Secured, also provides customers with a complete Worry-Free Guarantee on all ticket purchases. Based in Denver, Colorado, BuyAnySeat.com is a subsidiary of Denver Media Holdings. For more information, please visit http://buyanyseat.com.